Clever hunters have utilized these pigs' aggressive defence tactics by placing cheese around their home. When the curious mice go to investigate, they alert their hog friends who then immediately "spring" into to action to defend their home sty. Lunar lanterns have been affixed to their home to make transport easier without disturbing the piggies too much! The Floating Pig Fortress Trap Skin can be used on the Timesplit Dissonance Weapon. The trap's stats (power, power bonus, attraction bonus, etc.) are not changed. The Floating Pig Fortress Trap Skin may be made available during the annual Lunar New Year event and can be traded on the Marketplace or through Give To Friends. 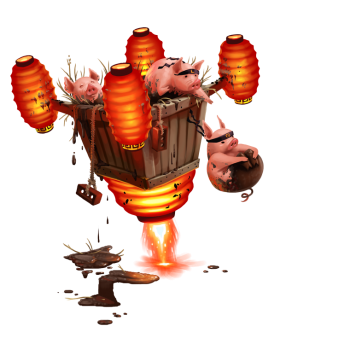 5 February 2019: The Floating Pig Fortress Trap Skin was released as part of the Lunar New Year 2019. This page was last edited on 5 February 2019, at 19:04.